Use a basket or bowl to gather some random items from your home. 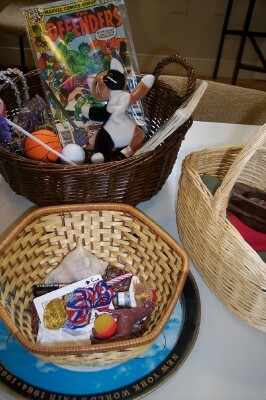 OR take a look at the picture below of a basket of random items. Possible items include: a model car, paintbrush, candy, dice, playing card, cow bell, a smile sticker, small teddy bear, and a comic book. Choose a random trinket that you find interesting. Take the item in your hand and think about a story relating to the item. It can be a memory or a fictional story. It can be happy, sad, funny, even quirky. If the object spoke to you, what would it tell you? Everyone enjoys, yet also sometimes despises, giving and receiving advice from family and friends. We usually do so verbally, but the goal of this exercise is to write our words of wisdom. You can give general advice, or choose a specific topic to give advice about, such as friendship, marriage or parenting. You can also choose to write the advice for a particular person or for anyone. This writing exercise requires bulleted sentences rather than extended prose. So, you will be working to find the correct words that you want to use in order to accurately express your advice and to find ways to summarize your ideas. You can write out thoughts, and then work to summarize into simple sentences. 1. If you have a “motto” or “words to live by” what are they? What are some of your favorite sayings? What are your “words of wisdom” that people should always remember? 2. Explain why these “words of wisdom” so important to you. 1. Choose a person for whom you want to give advice. Write down his or her name, a little bit of information about the person, and what type of advice you want to give. Try to be as specific as possible about what type of advice you want to give. For example: “I want to write advice to my niece who is getting married in four weeks. I want to give her advice about how to have a long, successful marriage.” Take the time to write a list of people and types of advice then choose one. 2. What three pieces of advice do you have for that individual? First, jot down as many ideas as possible, and then look at list to see what three themes arise. From these ideas, write your three pieces of advice. 3. What are three things you do not advise them to do? Again, jot down your ideas, then look at list to find themes, and then work into three things you do not advise them to do. 4. Re-read your previous responses (advice and what you don’t advise). How do they fit together? Is there an overall theme that arises? If so, what is it? What are your “words of wisdom”? This exercise was created by Jeff VanderMeer, a multiple World Fantasy Award winner is best known for his Ambergris Cycle. VanderMeer is also an anthologist, a blogger for Amazon.com, and the assistant director of Shared Worlds, a creative writing camp for teenagers at Wofford College. VanderMeer offers a two-part exercise that immediately gives participants a vivid image (two people on a beach) and asks you to look closely and notice revealing detail about human interaction. Part 2: Now, write the same scene (two people walking on the beach as described by their body language), but this time write the scene all in dialogue with no description.